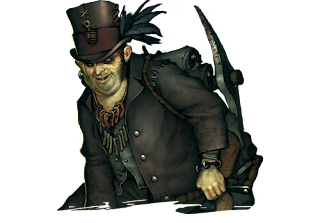 I had an idea for a series of articles detailing the top crews in the Malifaux meta at any given point in time. I’d call them “Wanted Posters” (since Malifaux’s Most Wanted was already taken,) and they’d give me a chance to take a look at the crews that are dominating right now and give players tips as to how they worked, what the key pieces were, and how best to overcome them. I recalled, specifically, the so-called “Rat Bomb” Outcast crews from 2016 that plagued the meta (pun unintended) before they were errata’d out of existence. The community scrambled to try and discuss how to keep from getting rolled by this toxic build, but they still ran wild and the "how do I beat this list?" posts were more or less constant. Articles like these Wanted Posters could have helped save some folks from a Negative Play Experience back in the day and given them a fighting chance, and I thought maybe I could try and get something like that ready now. 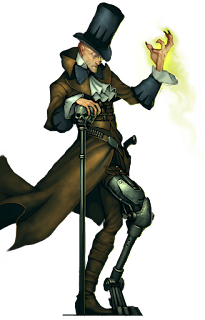 Plus, it would give me a chance to learn some things about Malifaux as a whole. At first, I was planning on doing one of these for a Misaki crew with the original version of her Thunder upgrade, especially after the havoc it caused at the UK Nationals. Then, of course, it ended up being nerfed in January, bringing that particular nightmare to heel a bit. 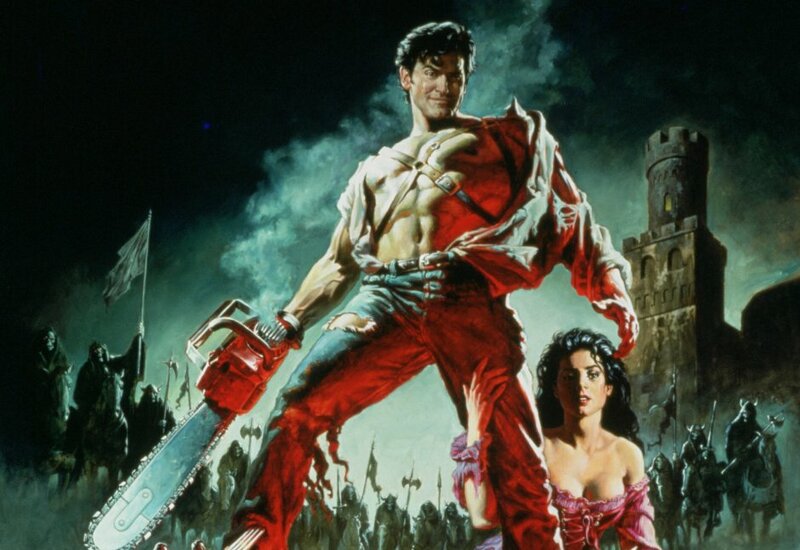 So I had an idea for a cool style of blog post, but no subject. And then I remembered the crew that’s induced the most moaning and groaning in the podcasts I listened to historically, particularly those recorded in the UK. One answer jumped out: Nicodem. So what is a Nicodem crew? What does it look like? What makes the crew work and, if it’s as bad as the UK meta seems to think, what can players do to beat it? Well, I knew I wasn’t the one to answer, so I went looking for outside help. Asking around the internet, I made contact with Travis Weyforth, host of the Max Value podcast and recent Nicodem convert. Max Value in particular has scoffed at the practice of spending so many points on things that don’t actually go out and score VP, though Travis has changed his tune a bit recently. His opinion, I thought, would be very informative. But, to get the inside scoop on the infamous UK Nicodem crew, there was really no one better to get hold of than the source of all this strife and woe, *sigh* Jamie F’N Varney (we’re contractually required to refer to him that way. Yes, even the sigh.) That, paired with some first-hand demonstrations and insight from a friend of mine, Rich Nave, led to the monstrosity below. 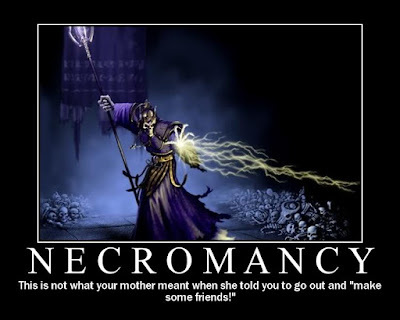 Profiles in Necromancy: How does the Nicodem crew work? Put simply, the strength of this crew comes from its access to cards. One of the balancing factors for summoning crews is that they have to expend their resources (in the form of cards and soulstones) to do what they do and get new models out onto the board. Resurrectionists in general have ways of getting around this, and Nicodem is particularly effective at it. But, before we get down to that, let’s take a look at the important pieces of the crew and discuss how they work. Nicodem- The man. The myth. The top hat. I mean, his name’s on the Wanted poster, so of course he’s the engine that makes this car run. His summoning is, obviously, the defining characteristic of the crew. The TN for Re-Animator (the Summoning spell) is 10 Double Crow plus the soulstone value of the undead minion he’s summoning, so cards and/or stones are the only way to make this spell work (he has one crow built in.) Like most summoners, he has some perks and some costs for his newly summoned troops. They comes in with only half of their wounds (assuming Nicodem doesn’t trigger and use some additional corpse markers to heal them), but any undead model within 6” of him gets a + to Ml and Df duels and undead models don’t gain slow within the same bubble, which takes away one of the main costs of summoning. Once the Undead are on the board, he can heal them with Decay and/or use Rigor Mortis to make them Fast. He’ll often bring the upgrade Maniacal Laugh, allowing him to take a (0) action and turn any corpse marker within 8” into a Mindless Zombie, granting a degree of mobility to his summoning. And last but not least, he draws a card whenever an undead model is killed or sacrificed within 6 of him. This is just good in general, but the crew exploits this with a few…we’ll say “loopholes” in the rules where mindless zombies and Sebastian come into play, resulting in an obscene amount of card draw that effectively lets Nicodem do what he wants on his turn, regardless of what cards he has in his opening hand. As someone who tried summoning Dreamer and, on the first turn of the first game, found himself looking at a hand with nothing bigger than an 8 in it, I can truly appreciate a summoner who is effectively agnostic to the twists and turns of deck randomization. 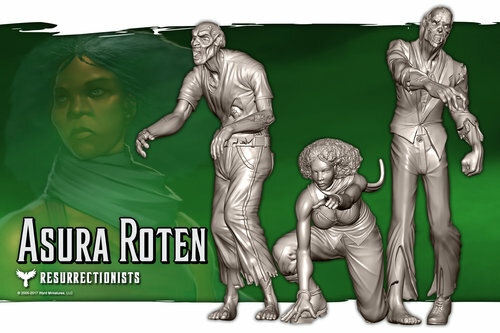 Asura Roten and Sebastian- These two are vital parts of the engine, functioning essentially as the fuel injectors. Asura can create a Mindless Zombie every turn, and Sebastian uses “Those Are Not Ours” to sacrifice it, drawing a card and gaining a soulstone. Because this is often done within 6” of Nicodem, that results in the drawing of another card. Two cards and a soulstone in exchange for basically spending no resources at all is a pretty good trade. Sebastian’s Under Cover action allows you to protect the summoning bubble from attacks that have gun symbols, and he isn’t completely useless in melee as a countercharger if it comes down to it (though, if it DOES come down to it, you’re probably in a lot of trouble). He’s also one of the models that can drop a scheme marker for Phillip to chew up on his activation for more cards. Asura, meanwhile, has an ability similar to Sandeep, allowing undead models within 12” to use one of her melee attacks. The worst of these, by far, is Grasping Hands, as it applies a condition that reduces your Df, Wk, and Cg by a point based on how many times you’ve been hit with the attack. That is, frankly, crippling, and adds a ton to the defensive abilities of the crew. The best way to stop a charging melee beatstick is to shorten his Cg down so he can’t reach you in the first place. Phillip and the Nanny- The joke of this model is that it’s basically just here for “Lost Knowledge,” a tactical action that lets P+N discard a friendly scheme marker within 6” to draw two and discard one. Now, it’s fast and, if used with things that can push it, can function as a very good scheme denier. But, come on. #realtalk, the cards are the reason you’re bringing Phillip. 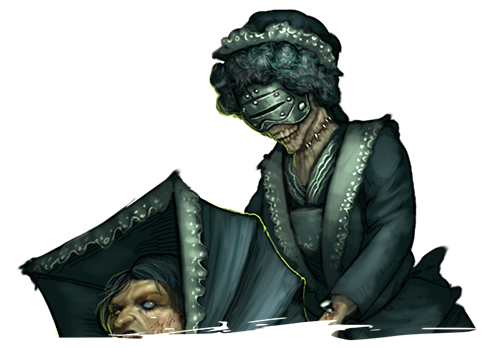 Corpse Bloat (aka Mortimer)- The assistant Gravedigger has been a staple in Nicodem crews from the beginning. However, he’s one of the few parts of this crew where you see variation. Jamie and several other Nicodem players I spoke to use him essentially every game. Travis, by contrast, considers him “trash” and just puts Corpse Bloat on Phillip to do the job of corpse generation, making them responsible for starting the engine and getting the car moving (to keep belaboring the metaphor.) The advantage to doing it this way, of course, is that Nicodem can then use Decay to heal him up for more corpse generation later. The disadvantage is that you’re putting your eggs in one basket and, presumably, that means killing P+N early could be a way of slowing the engine down. Plus, Mortimer has a tactical action on his card that costs 2 AP to summon a corpse, and so can summon 2 a turn (3 with My Little Helper which, let’s be honest, of course he’s bringing.) In other crews, I’ve seen the upgrade placed on Asura instead. YMMV. Either way, this piece’s job is, in the early part of the game, to generate the raw materials needed for Nico’s summoning. If you do bring Mortimer his other job is to provide a little bit more defense for the bubble. His shovel doesn’t do a ton of damage, but he is Ml7. Assuming he’s still alive later on, he also has Chatty to block interactions (so good luck doing Dig Graves.) Obviously, the advantage to consolidating and cutting Mortimer is that those points are then available for buying other models. Mr. Weyforth recommends putting them in for the Emissary. I would say, if you’re looking to try it out, try both and make your call based on your own experience. If nothing else, you’ll have the Mortimer model anyway from buying the boxed set. The Summons­ (and the non-engine stuff)- So if you’re spending so many points on the engine, you’re going to end up relying on Nicodem’s summons to do a lot of the work for you. The meat and potatoes summon is the Punk Zombie. Ml 6 2/4/5 with Flurry that you can plop out of thin air wherever you need it is nothing to turn up your nose at. Their attacks have a built in + to the flip, and Nicodem throws another one on, so these guys will routinely turn your deck over for you in a turn when they really get going. The new hotness, of course, is the Kentauroi. They add a degree of force-projection that was missing before (because, really, it just wasn’t fair that Nicodem couldn’t drop a Lampad in the opponent’s DZ turn one.) Also, they drop corpse counters all over the place when they move and are respectable in combat in their own right. Rotten Belles are still gross and good for summoning the enemy out of position and/or into the death bubble. In a pinch, he can summon the Students to specifically target a creature type if something particularly troublesome is coming for him. Also, there’s Hanged, and Dead Doxies, and Necropunks…you get the picture. 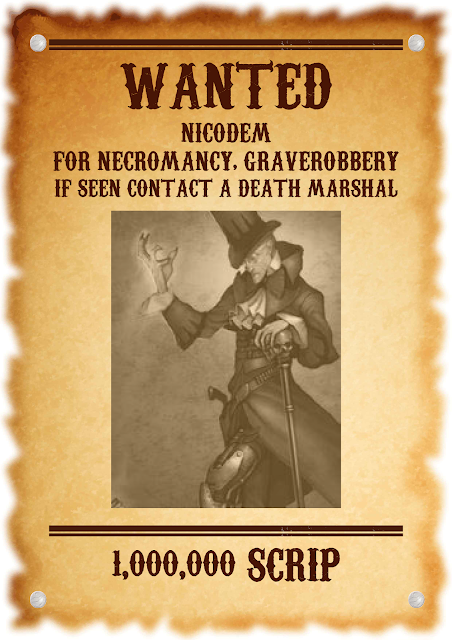 As an aside, the problem with Nicodem is that, every time a new Undead minion comes out, the designers have to keep in mind that he can summon them and cost them accordingly. So, in case you ever wondered why most of them are bad for their points cost, blame him. I mean, Molly and Kirai have something to do with it to, but Nicodem is a good target. The non-engine stuff (IE what you might hire from the beginning) have some flexibility as well, but mainly it’s to put some more attack and/or utility on the board to supplement the engine. A big counter-charger to keep Nicodem safe is usually not a terrible idea, so you might see Archie or a Valedictorian. The Emissary fits nicely, because the Death Puffin can either help the engine get running and/or go support the rest of the crew independently from the bubble (shards blocking LoS is still good.) Starting out with some Rotten Belles is usually not a bad choice either, and if you’re worried about something alpha-striking you (more on this later) the Belles can be a good counter-choice to pull the pieces out of position/into your death bubble to be killed safely. The new hotness (pun-intended) is the Lampad. Making them fast so they can push onto you, set you on fire, then knock you down to let you die from burning and summon a new one is very strong, as a 4 AP swing between crews is always one of the best power plays in Malifaux. I mean, you have some of the pieces at this point, but how does it all work on the board? Well, I could tell you, or I could just let Jamie do it. If you don’t know Jamie Varney, he’s won…all the UK tournaments? I don’t know. Most of them. He’s been the UK Master a couple times and came in second this year. He’s won Nationals. He’s won the GT. He’s the number one ranked player. He’s won all their stuff, basically, usually with some version of Nicodem/Kirai/Molly (so summoning Rezzers.) Let’s see what he’s got to say on how to play the crew, shall we? So I see Nico playing as an engine that is all about him. He buffs everything. +flips to DF and ML mean anything around him becomes much harder to kill and much better at killing. He is amazing at resource generation and at depleting your opponents. With your models on positives your opponent will often need to cheat to make a hit count and Nico's models won't. If/when you do kill his models it's generating cards and corpses for him. Being anywhere near Nico's bubble is a toxic place to be where you're really up against it and Nico takes it in his stride. He can pull you in with belles and reach out with Kentauroi, he is super versatile since Kentauroi and can seriously threaten almost anywhere on the board or just bring you where he needs to be using lures. Kentauroi and his/your models dropping corpses just makes his next turn stronger and if he has enough corpses to sacrifice 2 when summoning (usually late turn 2 or turn 3 with Kentauroi dropping and stuff dying) you're in a really bad place as he will bring in models fully or near fully healed and draw multiple cards for each summon. Good cards or bad cards it doesn't matter as you either use them or discard them end of turn. Black joker. Always keep it. Always. With all the +flips especially punk zombies (a flurry PZ can easily flip 18 cards in an activation) get it out your deck and likewise always get the red back in there. Use it to summon or make an attack hit. Just get it in your deck where it can have the biggest impact. Protect Nicodem. Don't put him in danger. Always be on the lookout for threats to him and try to stop them. Anything else is expendable. Think ahead. Nico needs set up. He usually needs to think a turn or 2 ahead, he has an answer to everything but if you need interacts for example you need a summon or model that didn't arrive that turn. So, is it hopeless? Sure sounds like it, and when you see the size of Nico’s hand at the end of turn one and realize that he has specially crafted his hand to make it borderline unstoppable, it can kinda feel like it. To give you an idea of how obscene this gets, I started a game with a Nico player recently on Vassal just to see the engine in action, and I watched him discard a 13 from his hand to activate an ability. It wasn’t that his hand had all high cards (there were, like, 10 cards in his hand at this point, and it was late in the turn.) It was because he wanted to hold the bad cards in his hand and stack his discard pile for next turn with severes. If he kept the bad ones, they’d be in his discard pile turn 2 and, thus, couldn’t affect his flips when he was going to be coming in to murder my face. And, of course, because he had SO MANY HIGH CARDS IN HIS HAND HE COULD AFFORD TO DISCARD ONE OF THEM. This was on turn one, it’s worth repeating. Well, here’s the good news. Nicodem isn’t unbeatable. Despite what some people think, Aaron does understand that Nicodem is very good and would have taken steps to nerf him in the 2018 errata if it was necessary. I’ll let Jamie throw his two bits (pence? quid? I don’t know UK money) in first. The weakness. In my opinion there is one. And it's Nico. He is DF 4 with no +flips. Get into him and attack him. Attacking stuff around him just uses your resources and gets him more and he can easily replenish his crew. It's not easy, especially with Kentauroi to get him out of harm’s way. Not much in the game can kill him in an activation and he has an amazing heal and a solid buffed crew around him to protect him, lure, slow, kill any threats. But it is the best way to attack his set up. He will punish you for it if you can't make it count when you go in but otherwise there is no hiding from him. He will lure in or use Kentauroi to get to your models and kill them piece by piece. If you play Nico poorly he is easy to defeat but played well he has insane board control, crazy resources and snowballs into an unstoppable force. Ok, that doesn’t sound super hopeful, but the idea is that the best day to deal with a Nicodem crew is kill Nicodem, and it’s not impossible to do so. Fighting his crew is like punching a huge marshmallow: it’ll yield and squish down, but it’ll just spring back to shape just as quickly and leave you tired (and a bit sticky…nevermind. Ignore that part.) If you can launch a decisive alpha strike on him in the first or (maybe) second turn and kill him, threat averted. The slingshotting Viktorias probably have the best chance of pulling this off consistently, plus their whirlwind lets them damage the rest of Nico’s crew while they’re at it. 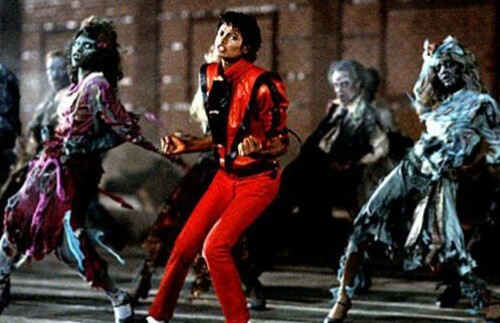 And, of course, once the man in the hat is dead there’s nothing else in his crew that can really do any damage to you. Anything that can bring multiple points of pressure onto Nico turn 1. One model is not enough, he will just kill it or tie it up. Or something that can take out a lot at once, Viks, Misaki etc or something that can pull nico out (not easy at WP 7) so Zipp or Asami. That makes it a bit clearer. Your alpha strike needs to be able to bring several threats to bear at once. Yasunori+Misaki, perhaps, or Viktorias and…some other fast thing from Outcasts (I don’t play Outcasts.) If you’re playing Rezzers, you can always give him a taste of his own medicine and Lure him out to take him down (not easy, but at least possible) or maybe some combination of Seamus plus a beater that gets lured forward and then charges in. There are options. The point is, bring multiple threats and jump on him early. If you wait until later in the game, the engine will be running and there will be no stopping him. Now, not every crew can pull off a turn one multi-front blitzkrieg (shocker.) Also, it may not be the right gameplan for every Rezzer crew your opponent might bring, so you’re gambling in a tournament situation bringing an “anti-Nico” crew that you might end up wrong-footed with an inappropriately suicidal crew. So what happens if you don’t have the perfectly crafted anti-Nico crew, but find yourself squaring off with the master Necromancer? Well, for that one, I turned to Travis, who just finished up coming in second at CaptainCon with Nicodem this previous weekend. Going for kills on nico isn't bad but it needs to be something that can kill him on one activation or very close. You aren't going to chip him down slowly. Any 3/4/6 type beater is scary because one red joker and he's in danger of dying. But even then you are just fishing for the joker and hoping, which isn't the best plan. So alpha strikes are always good if you have access to good ones and do it right, but don't alpha strike with some mediocre model. You’ll just be feeding him corpses. Instead, you can win with your scheme selection. You don't want to take any end of game schemes vs nico. You are always going to be out activated late in the game, and he just powers up over the game so things like take prisoner or covert breakthrough are super easy for him to deny late. You want schemes that score all at once (before end of game) if possible or alternatively ones that you score per turn like Dig Graves. You also need to focus on scoring points not trying to win the brawl. Unless you get an alpha strike early and get way ahead or manage to kill nico you are always going to lose the brawl, so instead focus on scoring what victory points you can early on. Any killing you do should be done to accomplish this goal, aid you in scoring VP, or to block him from scoring. Biggest thing is scheme selecting. Score points as quick as you can. By turn 4-5 you will almost certainly be at a huge disadvantage. The key thing that every Nicodem player I spoke to for this article repeated is this: he is beatable, it’s just that people don’t know how to do it. Play your strategies and schemes (since, you know, that’s how you win.) Don’t get intimidated by what he’s doing, and don’t try to knock him out unless you’re confident you can get it done in one clean blow. Instead, focus on getting as many VP as you can in the beginning of the game and denying him later, if possible. In a way, it’s narratively fitting to play against Nicodem if you think of it like a zombie horror movie. Your crew are the group of plucky survivors, trying to hold their ground against a relentless tide of the dead. You’re going to get overwhelmed. You’re going to get overrun. 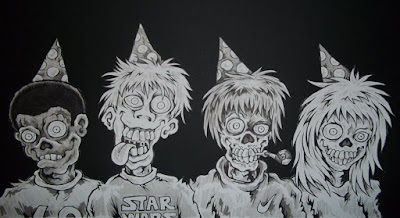 A big, grey tide of the dead is shambling your way, and you have a turn or two to prepare for their arrival. Make those turns count, because when the horde gets here your models are going to start dying. By turn 5 there may not be very many of them left. Understand that from the beginning, and keep your head about you. Keep your eye on the prize and play the scenario, and that will give you the best chance of winning in the end. Remember, Nicodem’s crew isn’t going to be trying to score points early on. It’s busy revving the engine up on turn 1. The Kentauroi being added to the crew means he’s at least going to be able to threaten you early on, but that’s nothing compared to what you’ll face later, and chances are he’ll have to send them out of the bubble to reach your key stuff. Grab your VP as fast as you can, and hang on as hard as possible until the final whistle. It’s not going to be easy, but the point is that it’s POSSIBLE to win, and this gives you the best shot at doing it. I hope this was informative and somewhat entertaining. Many thanks to my contributors. You can find Jamie on Twitter being relentlessly hounded about how broken Nico is @FlippinWyrds. 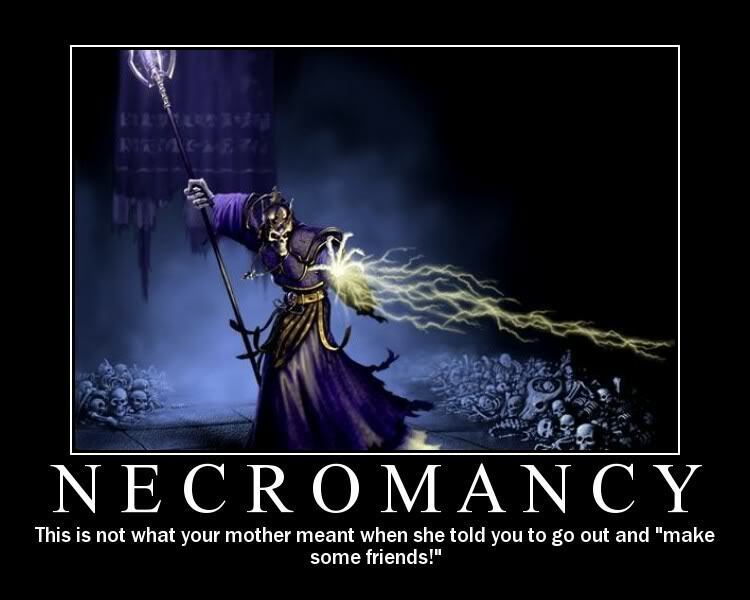 You can also sometimes hear him on a podcast, the Flippin Wyrds Malifaux Podcasts, though they’ve put out two episodes in three months, so don’t hold your breath (we tease because we love). Travis can, of course, be heard on the Max Value podcast, likely telling you why Larry, Roger, or Alex are wrong (today.) He wants to invite people to register for the Capital City Meltdown tournament, May 5-6 in Laurel, Maryland. If you don’t go, you’re a bad person and you should feel bad about yourself. Lord knows, I do. And, of course, thanks to Rich, who’s on FB and usually on Vassal Tuesdays making Phiasco or I sad by summoning far too many things.